I’m a touch typist. I’ve been comfortable at a QWERTY keyboard of one kind or another for well over half a century, but there’s something about digital writing that seems ephemeral to me, unreal in some way, as though it can’t really last, or won’t be treasured by someone years hence who happens across it, or something like that. I confess to a preference for handwriting in a journal. I’m especially fond of the Moleskine© “Cahier”, the soft binding and archival paper of which suit my purposes nicely. I can’t journal comfortably on a computer, even though I’d probably be more prolific (and since I’m accustomed to thinking while typing, perhaps even more spontaneous). But I guess I’ve been captured by the image of the mysterious diaries found in old trunks and old treasure maps brown with age from the books of my youth. Those things are probably unheard of among today’s generations; their Treasure Islands are in video games, and their maps have GPS coordinates. I guess another thing about it is the underlying conviction that there really is no privacy in the digital world that doesn’t sacrifice at least some spontaneity. Furthermore, writings encrypted in 256-bit AES aren’t likely to be stumbled on accidentally by later generations, which certainly removes that little romantic aspect. In any event, I will most likely continue journaling on paper with my trusty Paper Mate Profile© . There are other aspect to serious journaling that renders digital rather less than optimum for me. 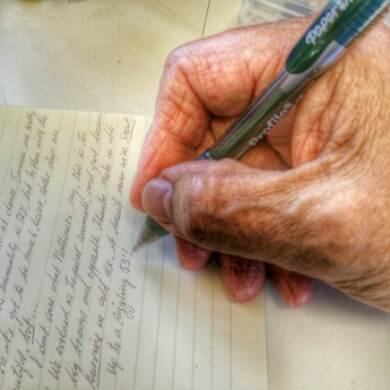 Apart from the tactile sense of making the words belong, there’s the matter of being able to easily page back and forth, make notes on previous pages, underline earlier thoughts that suddenly stuck out when reread, and the undeniable fact that thoughts connect differently in the slower tempo of handwriting. There’s also that ineffable feeling attached to something that you can hold, possess, handle and — if necessary — hide. These all connect, I am sure, to the circumstances of my childhood. However, they are warm fuzzies, and anything of that nature from that part of my life is to be treasured for itself alone. This is sort of stream of consciousness, but it leads up to something that I believe is highly important in recovery — the ability to put thoughts down in a form and place where they are ours alone. Especially in early recovery, there are many things that we are simply unable to share with others, but that need to come out. That can happen in a journal as in no place else. I don’t care how spontaneous you are, you are going to self-edit your blog, your conversations and your sharing. That’s such an ingrained habit for addicts that it’s inevitable. It takes years to reach the point — if we ever do — that we can be completely candid with others. A journal can allow the truth to come out, if we let it, and we can even go back and compare today’s truths with yesterday’s. Finally, there’s the phenomenon that occurs when we put things down on paper or have to explain them to someone else. It forces us to organize our thinking instead of allowing our head monsters to drag us around by our thoughts. That’s another place where being able to easily review ideas from previous entries can be valuable: we can see for ourselves the changes that occur over time in our recovery. Journaling gives us a record of our craziness, the ability to measure our progress in our program (and laugh about past crises), and instills a sense of discipline foreign to most addicts. All of the folks I sponsor do it, along with their morning readings and meditations (on which I also insist). I recommend it to you, as well. This entry was posted in addiction, alcoholism, recovery, self-esteem, Shame and tagged discipline, Early Recovery, journal, journaling, writing on May 31, 2015 by Bill.